Classes for homeschool kids and those with alternative schedules! There is still availability in the following classes. Please call 503-231-1232 ext. 2 or email us to enroll! This class is intended for families who want to learn to fly together! Moms, dads, siblings, aunts, uncles, and family friends are all welcome to attend! Learn new skills and games as an individual, a pair, and a group. Learn spotting techniques and gain confidence on the playground and beyond. Tuition is for each individual student, regardless of age. Swing, tumble, create, and perform! This 90 min. class expands on our classic trapeze and acrobatics class, adding aerial apparatus such as silks and hoop (lyra) to the curriculum. 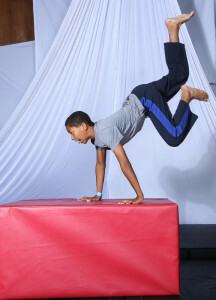 Students build confidence, grace, and strength as they discover their own potential, and cooperative group skills as they learn partner tricks, explore physical theater exercises, and create their own unique end-of-the term show. Schedule will change over Summer Term. Please click here to view our Summer Weekly Class Schedule. Family and friends of students are invited to observe the first day of class. Experience has taught us that the presence of family and friends is often a distraction to students. Therefore, after the first day of class, we ask that students have the opportunity to attend without the potential distraction of an audience (either their own or another student’s). Instructors are available to discuss each student’s progress, class experience, as well as potential exceptions to this rule. Family and friends are invited to a short performance at the end of each class. To review all school policies, click here.